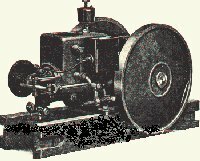 Parts listed here are for the sparkplug model Lauson engine equipped with the Wico "EK" magneto. Some parts may interchange with the earlier ignitor model. We can help on bearings, rings, valves, etc. for larger sizes. 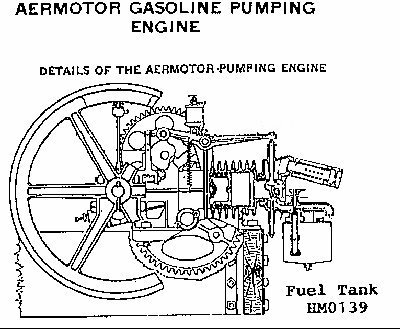 AEROMOTOR "8 Cycle Pump Engine"
This unique engine is actually a 4 cycle with a cam and gears designed to let the engine fire every eighth revolution. The second half of the 8 cycle drew air into the cylinder without combustion, a slick way of cooling the engine. We have some used parts, but pickins are slim. Associated, United and Amanco are basically the same engine. There may be differences in the hopper and carb, but most parts interchange with part #s being the same also. If your engine has an oval shaped nameplate on the hopper the HP rating will be slightly higher (the 2HP will be the same as 1-3/4HP, the 2-1/2 same as 2-1/4HP, etc.) If in doubt, give us your cylinder bore diameter when ordering. Please call for used parts. We should be able to help on any size rod bearing you may have to send us the rod and cap. Main bearings have to be poured in block & caps. We can supply babbitt and offer a brochure on pouring babbitt.